Vientiane, Lao PDR, 30 August 2013—The People’s Republic of China has agreed to share more hydrological data with the cruises Mekong River Commission which will improve flood forecasting in the Lower Mekong countries. 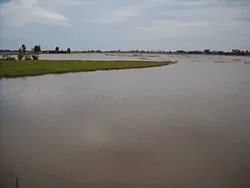 For the last 10 years during the four months of the flood season, China has shared with the MRC its water-level and rainfall data from its two hydro-meteorological stations located on the Lancang/Mekong mainstream at Yunjinghong, and on a tributary at Manan. The near real-time data provided by China has enabled the MRC Member Countries in the Lower Mekong — Cambodia, Lao PDR, Thailand and Viet Nam — to strengthen their river water-level monitoring and improve the accuracy of flood forecasting as well as mitigate the negative effects of flooding. As China renewed its data sharing cooperation with the MRC this month, the upper Mekong country agreed to extend the period of hydrological data sharing and increase the frequency of the information exchange. Under the previous agreement, China had shared its hydrological data from June 15th to October 15th every year. From now on, China will extend the hydrological data provision by 30 days, starting on June 1st until October 31st, every year. China also agrees to increase the frequency of the data sharing from once a day to twice a day. “This new agreement is another milestone of the MRC’s cooperation with China. It not only demonstrates the importance of enhanced information-sharing between China and the Mekong Countries, but also their commitment to continue and increase cooperation”, said Mr. Hans Guttman, the Chief Executive Officer of the MRC Secretariat. “The availability of more information will enable the MRC to better undertake its role of providing objective and scientific analyses of flood and drought events and improve understanding of the Mekong River Basin. The MRC will build on the success of this greater cooperation in enhancing further engagement with China,” added Mr. Guttman. The MRC and China signed an agreement on the data sharing in 2002 and renewed it in 2008. Since then, China has provided data of precipitation and water levels collected from the two monitoring stations. 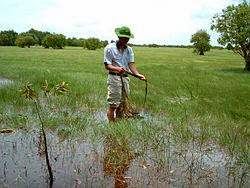 During 2010, the region was hit by a severe drought due to extreme low rainfall in the dry season and a particularly early end to the wet season in 2009. China was able to provide the MRC with hydrological data for emergency use. China has expressed its willingness to share the data during the dry season should similar emergency conditions occur. “As dialogue partner of MRC, China attaches great importance to the dialogue partnership with MRC and is willing to deepen the substantive cooperation with MRC and its member countries in the areas of hydrological data sharing, hydropower development, flood management and disaster mitigation, environmental protection and personnel exchanges under the principle of friendly consultations and mutual benefit, ” said Mr. Zhang Yue, the Minister-Counsellor and Permanent Representative of China to the Economic and Social Commission for Asia and the Pacific (ESCAP). In addition to flood forecasting and mitigation, the data has also been used in other areas of the MRC’s work including basin development planning, environmental monitoring and hydropower development planning. The MRC and China cooperate in several areas including navigation, water resources, and hydropower development, through activities such as knowledge and information exchange and technological and technical exchanges. The MRC is the inter-governmental body responsible for cooperation on the sustainable management of the Mekong Basin whose members include Cambodia, Lao PDR, Thailand and Viet Nam. The Commission looks across all sectors including sustaining fisheries, identifying opportunities for agriculture, maintaining freedom of navigation, flood management and preserving important ecosystems. In 1996 the MRC held its first Dialogue Meeting with its Dialogue Partners, China and Myanmar. 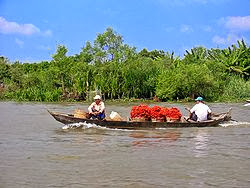 On 1 April 2002, the People’s Republic of China signed an agreement on the provision of hydrological information on the Lancang/Mekong River. Under this agreement China now provides water-level data in the flood season from two stations located on the Lancang River in China. This information is fed into the MRC’s flood forecasting system. 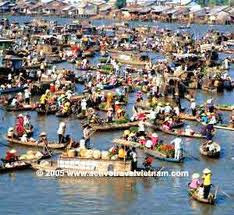 China contributes 13.5 per cent of the flow of the Mekong River.